CHX Technologies is a dental pharmaceutical firm. Alembic has implemented marketing and engagement programs for web, email, and social platforms to internationally promote and sell Prevora - an antibacterial tooth coating. 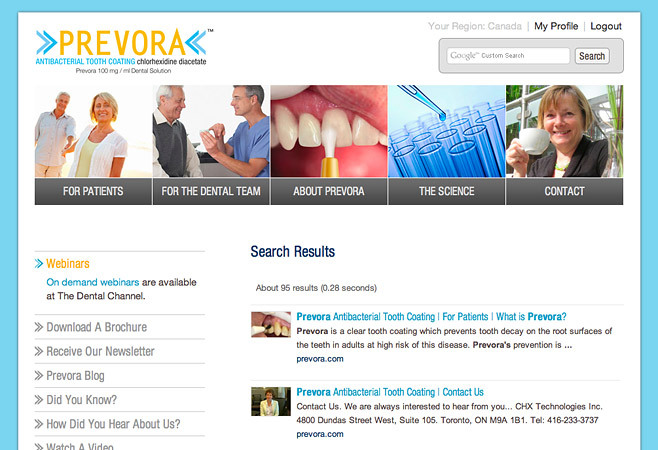 The Prevora web properties channel visitors from distinct global regions toward differentiated user experiences for consumers and dental professionals. Critical e-commerce application data including product pricing, currency format, logistics processes, dental clinic location data, and payment gateways are managed using regional variables. Managing region-specific content using server-side processing maintains a high level of consolidation within the back-end inventory and sales management web application and streamlines web production, content management, and compliance processes. The Prevora sites present an engaging, content-rich experience. 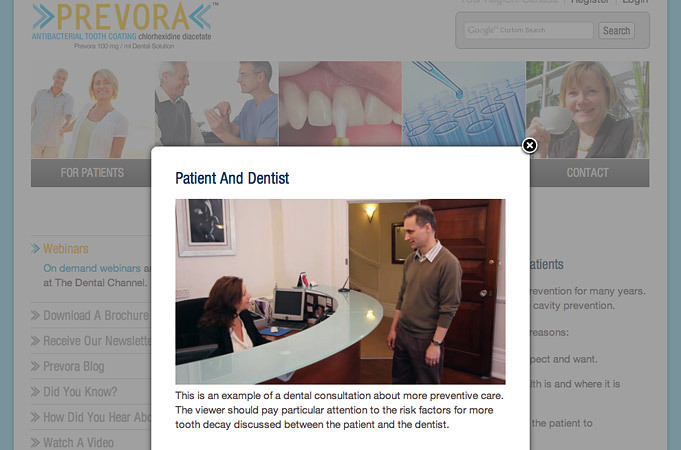 The content experience includes inline, contextual modal video display, patient self-assessment forms, testimonials, dentist locator with Google maps integration, user polling, blog syndication, quick facts, webinar registration gateway, and organic newsletter sign up. 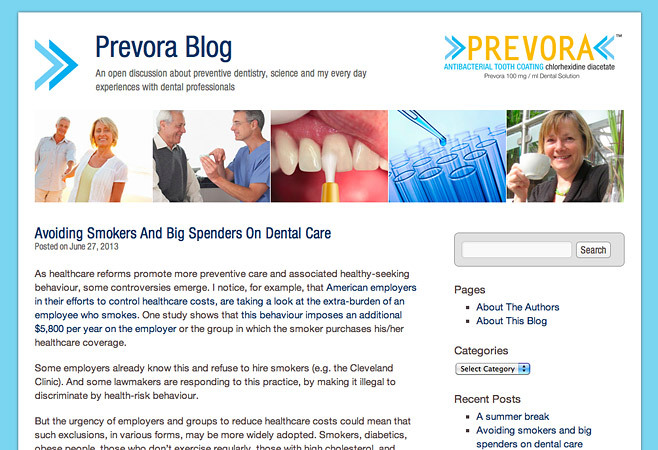 The Prevora Blog is a custom Word Press theme with alerting linked to the registered subscriber database. 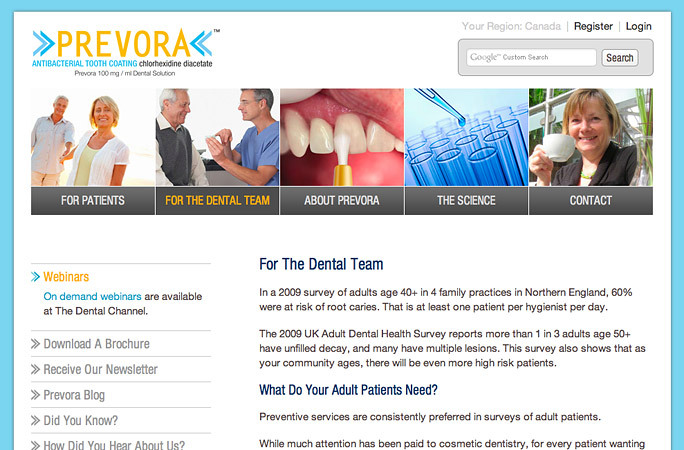 The custom themed Word Press installation ensures branding consistency across web properties and user experiences and provides a vehicle for timely, information-rich articles to be delivered to the inboxes of dental professionals - all from a user-friendly, client-accessible content publishing dashboard. Web properties and the inventory and administration tool leverage numerous third party APIs and data sets for seamless, region-specific integration of payment processing, logistics and fulfillment, inventory management, search functionality, distance measurement and email newsletter subscriber management. 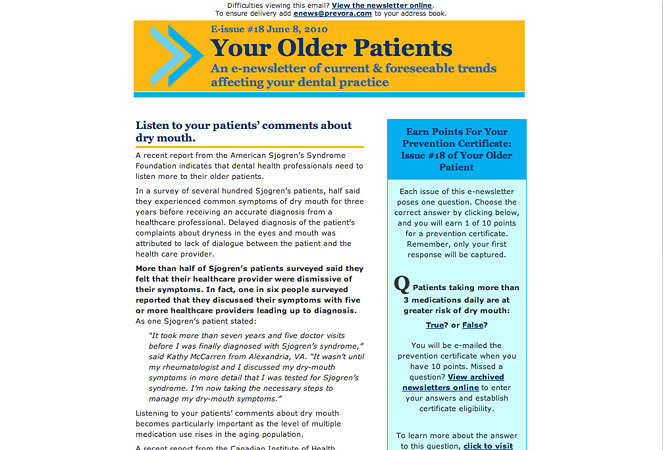 The "Your Older Patient" email marketing campaign delivered informative preventive dentistry news to subscribed dental professionals. Each issue incorporated a skill-testing question, the response to which was captured to the application database and tabulated on an ongoing basis. Once a threshold of correct responses was reached by the subscriber, the application generated a customized continuing education certificate in PDF format, and delivered it to the subscriber's inbox.